Nippon Hydro-Gloss & Hydro-Matt are Malaysia's first environmentally friendly paints for wood and metal and the Winner of the Quality Award (Homedec 11). The paints are specially formulated with water for optimum eco-friendliness. These paints are low in volatile organic compounds (VOCs) and odour compared to conventional wood and metal paints, so they are saferfor you and the environment. With fast-drying and splatter-proof qualities, application is easy. They also resist rust and wood rot. These pairlts also prevent discolouration of white compared to solvent-based paint which will mm yellow over time. Apply Nippon Hydro-Gloss or Hydro-Matt after a coat of Nippon Hydro Primer, for a long-lasting and complete eco4riendly solution for wood and metal. This paint solution is perfect for wooden doors, metallic grills, wooden furniture and handrails. It provides a perfect finish, and it is safer for everyone and the environment. Ensure surfaces are dry, smoothened and clean. Apply one coat of Nippon Hydro Primer to ensure better adhesion and durability. Apply two to three coats of Nippon Hydro-Gloss or Hydro-Matt. Wait two to three hours before applying the next coat of paint. With global Warming and the recent change in global weather patterns it is likely that rainfall patterns will continue to change bringing shorter but heavier bursts of rain causing flash flood and soil erosion. We have witnessed this as rainfall recorded in some parts of Malaysia has shown a marked increase in the last five years. Commercial and household water consumption has been increasing steadily in the last century. As the climate warms, so new ways will have to be found to reduce, reuse and retain water. Users call no longer assume that there is an endless supply of water even in a country with high aver- age rainfall per year like Malaysia. This is already evident from the occasional water rationing as well as considerable price increase of municipal water supply. This is where rainwater harvesting and recycling come into the picture. With water charges at the present level, the payback time on such a system is typically 10-20 years, If you consider commercial properties with large roof areas and high consumption of non-potable water, the payback time can be much shorter. However the benefits are much greater than just financial, the environmental aspects of rain water recycling are also very great. Collected and filtered rain water can be safely used to flush toilets, water the garden, wash clothes, wash car and general cleaning. Being soft water and chlorine free it is kind to washing machine, cleaning surface, plants, skin and does not leave behind unsightly scales and stains. * With a rainwater harvesting system we can all contribute towards a sustainable future. * A rainwater harvesting system can provide water for non-potable (non-con- sumption) purposes, such as flushing toilets, washing laundry, watering the garden and washing cars. By substituting municipal water with rainwater for non-potable uses alone, we can halve the amount of municipal water used by a typical premises. Thus rainwater collected can make an important contribution to our dwindling municipal water supply. * Roof rainwater can be of good quality and may require minimal treatment before non-potable usage. As rainwater may be contaminated, it is often not considered suitable for drinking without prior treatment. 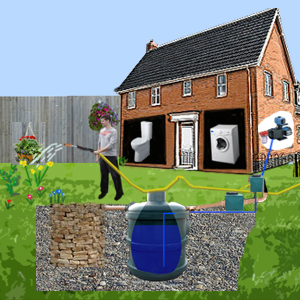 * Rainwater harvesting reduces your water bills. * It can provide aka-native water supply during water supply rationing or intermpti6n. * RWHS enhances the value of a property and can satisfy the water requirements of various levels of certifications for a sustainable home. * RWHS forms part of the rain- water management scheme, by reducing storm-water runoff thus reducing or mitigating the possibility of flash flood. * Rainwater is naturally soft. It is ideal for washing machines as it reduces the amount of detergent required and reduces the build-up of lime scale. * Being chlorine free, it is excellent for watering the garden and filling ponds. BACFREE ventured into the rainwater harvesting industry in Malaysia in 2007. In 2009 they were appointed as the Malaysian and Singapore partner of the industry leader in rainwater harvesting WISYAG of Germany. They provide clients with rainwater harvesting systems that are fully compliant to Malaysian and international best practice guidelines.